Here is the Senate version of the bill. There is voucher legislation pending. Here is the anti-voucher advocates' web site. At the bottom is the legislation and their (universal) anti-voucher arguments. It didn't take long for school voucher advocates two file not one but two versions of the Opportunity Act. Last session's versions cleared committee before dying in the Democratic Assembly caucus. The Kean bill continues the false advertising of the voucher advocates. Gordon MacInnes is a fellow at The Century Foundation in New York and previously was a lecturer at the Woodrow Wilson School at Princeton University. He served as the assistant commissioner of the New Jersey Department of Education and was a member of the New Jersey State Senate and General Assembly. MacInnes also directed the New Jersey Network and was the first director of the Fund for New Jersey. He lives in Morristown. GOVERNOR Christie is feeling pretty good about school reform. First, he succeeded in demonizing teacher unions, then he got reasonable people to buy into his school voucher program. Now he has made his nationwide pitch on "Morning Joe," the popular MSNBC show that last Friday aired live from Fort Lee High School and devoted much attention to the sort of reforms Christie envisions for New Jersey. We readily support some of the governor's ideas. He is right, for example, in seeking a more streamlined and more efficient approach to teacher tenure. For too long, too many ineffective teachers in New Jersey have been allowed to linger on, year after year, in failing classrooms. But we are troubled by the governor's voucher plan, known as the Opportunity Scholarship Act, which would give companies tax credits to pay private or parochial school tuition for students in a handful of pilot districts. Leaders of the teachers' unions, according to the governor, "have made it very clear to me and to the Legislature that it is an unacceptable alternative that they will fight every way they can — all vouchers," Christie said. First, just because the idea is opposed by teachers' unions — the governor's sworn enemies, politically — doesn't make it good education policy. The voucher plan may sound promising on the surface, but it's flawed. We are disturbed by the thought of tax dollars going to pay for a child's private education. In the case of those with religious affiliation, we see a violation of the separation of church and state. Finally, it stands to reason that money taken from state education coffers will, in one way or another, hurt public schools. We might not have all the answers concerning elementary and secondary education, but we do know that the problems are widespread and entrenched, and too complex for sound bites. The war of words between the governor and the unions is counterproductive, a sideshow that must end if we are ever to see any constructive dialogue on the matter of improving public schools. TRENTON, N.J. -- New Jersey Gov. Chris Christie on Wednesday called for the resignation of a state teachers union chief who said "life's not always fair" while making an argument against vouchers to send poor students to private schools. New Jersey Education Association (NJEA) Executive Director Vincent Giordano made the comment on the local "New Jersey Capitol Report" program over the weekend. During the interview, he was challenged by the host on why low-income families should not have the same options as other families when their child is in a failing school. "Those parents should have exactly the same options and they do. We don't say that you can't take your kid out of the public school. We would argue not and we would say, 'Let's work more closely and more harmoniously,'" Giordano said. When told some families cannot afford to finance the shift to private school without government help, Giordano said, "Well, you know, life's not always fair and I'm sorry about that." At a press conference in Westfield, N.J., on Wednesday Christie said, "I cannot express how disgusted I am by that statement by the head of the largest teachers union in our state, but I also have to tell you I'm not the least bit surprised because I think it so succinctly captures what their real position is." Giordano also said in the interview that the union's "record of support for urban education and disadvantaged children is unimpeachable." He said the union does oppose vouchers, but only because "they will take resources from disadvantaged public schools and only exacerbate the challenges faced by students in those communities." TRENTON — Supporters of a bill to give scholarships to tens of thousands of students in failing public schools to attend private and parochial schools rallied on the Statehouse steps today, urging legislators to take action. Most of the 2,500 demonstrators were parochial school students participating in what organizers called a "field trip" and a "lesson in civil rights." The mostly teenaged students wore bright blue scarves emblazoned with an image of a life preserver. Paterson Archdiocese Superintendent John Eriksen and leader of We Can Do Better, a group lobbying for the bill (S1872/A2810), known as the Opportunity Scholarship Act, organized the event. "We want the legislators to hear the voices of the children," Eriksen said. "There is no reason a family in Paterson whose house burned down and is struggling to send their children to private school shouldn’t benefit from this legislation." The bill would solicit corporations to offer tax-deductible donations to fund the scholarships. The Legislature has to act on the bill by mid-January or it must be reintroduced once new legislators are sworn in. Jack Goan, 14, an eighth-grader at Christ the King School in Haddonfield, said he supports vouchers even though his family can afford his tuition. "At public school, all the kids have to learn at the same pace, but here, you can go at your own pace," Goan said. Students from Immaculate Conception in Montclair and Benedictine Academy in Elizabeth also demonstrated. Though Gov. Chris Christie has touted the voucher bill as a signature piece of his education reform agenda, the legislation has stalled since February. At the time, Democrats expressed concerns over the size of the bill, which would create a pilot program for 13 towns and up to 40,000 students who would receive scholarships of $8,000 per year for elementary students and $11,000 for high school students. Assemblyman Angel Fuentes (D-Camden), one of the bill’s sponsors, said the pilot program could be pared down to serve only five districts, including Camden, Newark, Paterson and Asbury Park. Elizabeth and Trenton are also being considered for the fifth district. Those who oppose vouchers held a competing rally Wednesday in Jersey City organized by the Newark-based Latino Institute and Save Our Schools, a grassroots coalition of parents and community leaders. 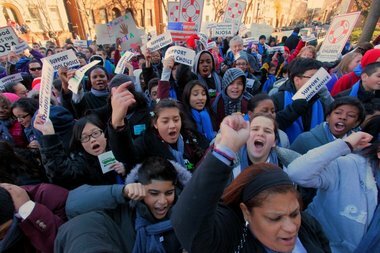 "Today’s pro-voucher rally is an example of the corrosive influence of money on our democracy," said Bill Colon, director of the Latino Institute, and Julia Rubin, leader of grassroots organization Save Our Schools in a joint statement. "Twenty years of voucher experiments have proven that vouchers do not help a single child."